← Is social mobility enough? Are young people turned off politics? Will they vote? Do they care who wins the election? Are all parties the same? Are the candidates just hacks mindlessly parroting their parties’ approved slogans? 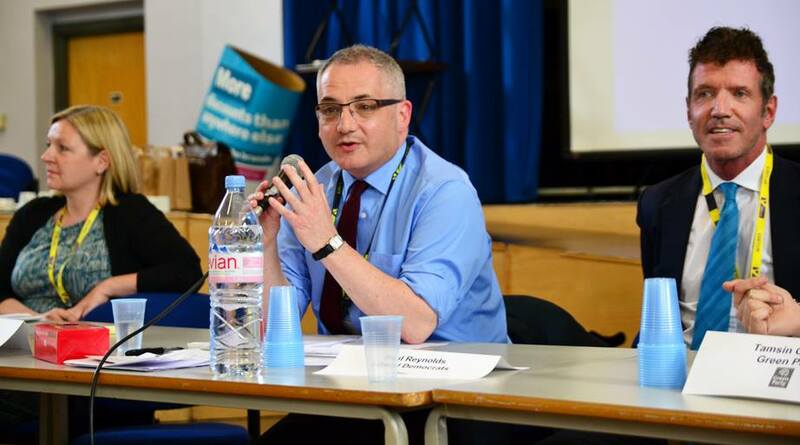 This week’s general election hustings at Newham sixth form college (NewVIc) challenged many assumptions about ‘business as usual’ and young people’s alleged lack of engagement with politics. We welcomed 6 parliamentary candidates, each of whom is standing in one of the 2 Newham constituencies: East Ham or West Ham. 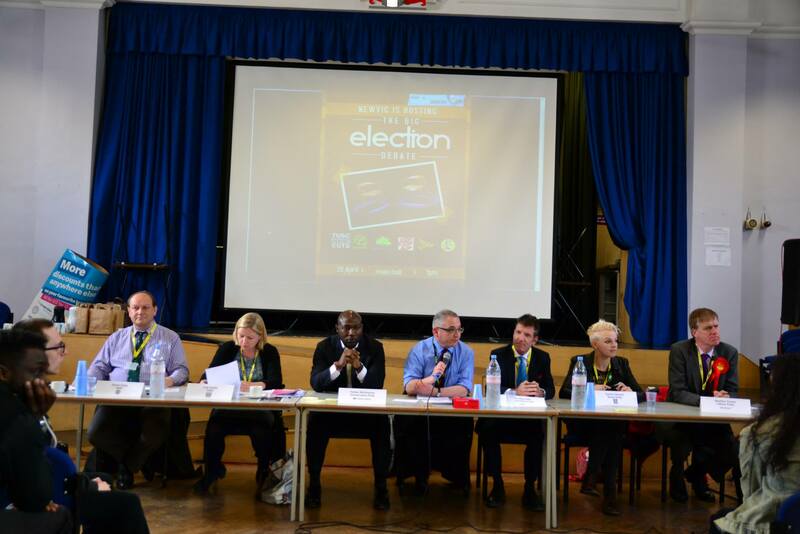 They represented the full range of parties standing: Conservative (Festus Akinbusoye), Green (Tamsin Omond), Labour (Stephen Timms), Liberal Democrat (Paul Reynolds), TUSC the Trade Union & Socialist Coalition (Lois Austin) and UKIP (Daniel Oxley). The meeting was attended by around 100 students in their free time and they were fully engaged for nearly 2 hours. Less than half of these young people will actually be able to vote on May 7th as many are still 16 or 17 years old. But all were eager to hear what the candidates had to say. As the chair, I had the task of trying to keep the candidates in order and focused on the questions which students were asking. This was actually not a problem, the speakers were reasonably disciplined and kept to the point. On the whole our candidates were refreshingly direct and free of slogans or platitudes and their personal commitment came through pretty strongly. My impression was that they all took our audience seriously, treated them as adults and made no assumptions about what they were interested in. We didn’t have time to address all the topics which students wanted to raise but we did cover a lot of ground. All the candidates were asked about the impact of austerity on local people in Newham, their positions on university tuition fees, global warming and immigration. There was plenty of disagreement but each candidate was allowed to make their point so that people could judge for themselves. Based on the strength of the applause, this was an audience strongly opposed to both austerity and tuition fees. We also had a round of questions aimed specifically at each party; mostly challenging them in some way. Labour was asked how different its spending plans would be compared to the Coalition’s. Stephen pointed to the growth in food banks and gave many examples of Labour’s very different priorities including a much greater emphasis on jobs and poverty reduction. Tamsin was asked how the Greens would pay for their living wage commitment and she reminded us that Britain is a rich country and that we can shift resources away from Trident for example. For UKIP, Daniel was challenged to define the ‘British culture’ which his party seems so keen on. His reply that it’s hard to describe but we’d know it if we saw it – “like a sausage” – did rather mystify many in the audience but his case for leaving Europe was more cogently argued. One student asked Paul how the Liberal Democrats could ever be trusted again after their tuition fee U-turn and the reply was mainly about the reality of coalition politics and the fact that no single party can get its whole manifesto through. For the Conservatives, Festus was asked whether his party was ‘for the rich’ and he told us a little about his own story of aspiration and achievement from an unpromising start, first as a basketball player and then as an entrepreneur. He wanted policies to encourage enterprise and success and not stifle it. TUSC was asked a rather supportive question about its plan to reverse austerity and this gave Lois the opportunity to argue against governing in the interests of the rich and big corporations and in favour of expecting them to pay a much greater share. What we got was a real diversity of opinion and very different visions of the future, argued with passion as well as evidence. Our candidates came across as real people with life experience beyond party politics. None of them sounded like the Westminster insiders we see so much of in the media and the debate was all the better as a result. I think most of the students present will have come away with a sense that we face some genuine choices, that politics really matters and that voting can make a difference. I think they also understand that voting once every 5 years is only the start of full citizenship. 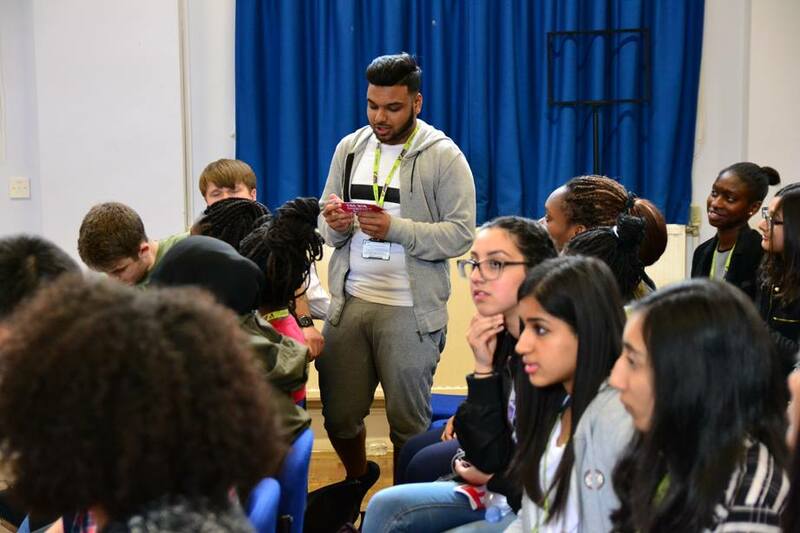 As most of the candidates emphasised in their different ways, young people need to be well informed, to engage in activism and campaigning and to work with others and fight for what they believe in. NewVIc students have a proud record of political engagement and this election debate is only one of many activities our college offers to help them develop the knowledge and skills needed for active citizenship, for example through political education and experience of advocacy, debate, community organising and leadership. No doubt our students will continue to debate the issues and we’re looking forward to our on-line student poll to be held on May 7th. We recently celebrated the highest ever participation rate in our student union elections so we’re hoping for a similarly high turnout for this one. I want to thank all 6 candidates who made time in their campaign diaries to attend our debate and took it so seriously. They clearly can’t all win but we will follow their progress with interest. A big thank you also to NewVIc teacher Robert Behan and his A level politics students, and to Kate Reed and Steven Kern, our student development team for all the planning and preparation which contributed to the success of the event. This entry was posted in NewVIc, Politics and tagged Democracy, elections, Newham, Newham Sixth Form College, NewVIc, political parties, politics, young people. Bookmark the permalink.